The mountainous Great Barrier Island is the last stop on the very outer edge of the Hauraki Gulf before the vast blue of the Pacific Ocean. During summer, this island is relatively busy. Hundreds of small bays are dotted around the calm, western side of the island that looks back towards the mainland, while the outer, eastern edge has broad, white-surf beaches. As soon as autumn starts, the seasonal ferry stops, and access to the island is limited to a small propeller aeroplane service. The Great Barrier Island is also off the electricity grid. Mobile phone reception is patchy, and there is no public transport, street lighting or banks. In other words, if it’s refuge from modern life you want, this is where you’ll find it. Nicola and Lance Herbst, the duo behind Herbst Architects, have designed eight distinctive, contemporary baches (small holiday retreats) on the island, including one of their own. 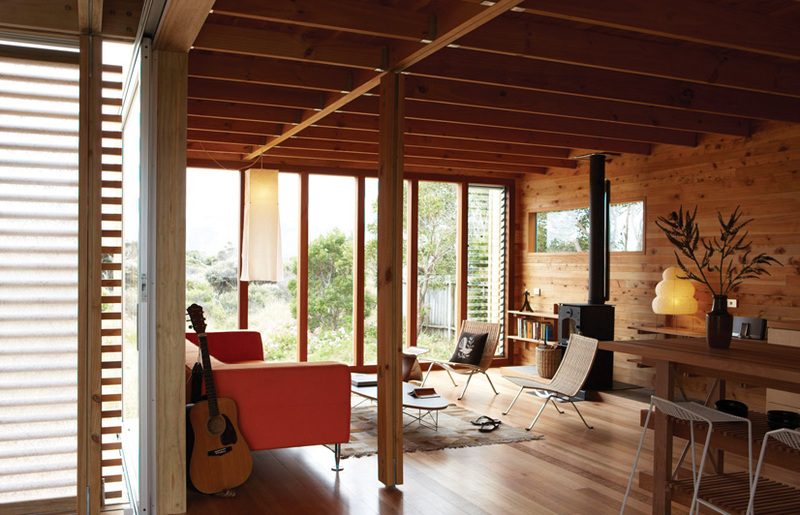 Timms Bach is their latest creation, and features a back-to-basics approach to holiday living. 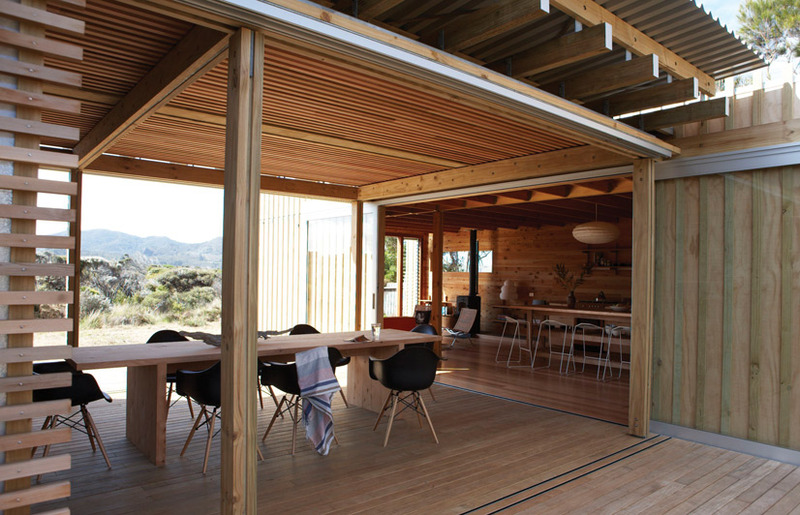 The Herbst’s increasingly sophisticated and intuitive understanding of the island coupled with the robust sensibility of the Kiwi bach, seen to good effect in this project, offers an interestingly fresh approach to a part-time life in the bush. It is also a highly sustainable project: from the materials involved in its construction to the building’s independence of external power and water services. The demands it makes on the world are minimal. The site, located on the wild, ‘bushier’ west side of the island, is a classic ‘quarter-acre block’, roughly 16 metres by 50 metres long. Kaitoke, a long, unbroken stretch of white sand and surf, is the closest beach, and the Timms Bach site backs on to native ti trees surrounding the tiny Claris Airport (effectively a single grass landing strip). The road that extends down to Kaitoke Beach is flanked by a small subdivision of single sites. Creating a sense of seclusion from the neighbours was the next step. As much of the land on the Barrier is protected by the Department of Conservation, new buildings tend to exist in small pockets, and so the issue of privacy is not a new one for the Herbsts. ‘The site dictated a long, skinny solution,’ says Nicola. The result is an elongated but simple rectangular plan, the two longest sides of which hold the bach’s communal spaces between them. The plans were conceived as a single interior and exterior design project, revolving around this outdoor space. Unlike traditional beach houses with an internal entertaining area that opens out onto a deck, in the Timms Bach the deck is the entertaining area. It has sliding shutters of western red cedar to each side, an open fireplace at one end and, at the other, large sliding glass doors that lead into the kitchen. The shutters were carefully engineered and fitted to block out any drafts. This was important, as the wind on the island has a capricious character – it can come from nearly any direction. The screens also give the owners flexibility to close or open up the space completely, or just block off one side. Creating a tricked-out super bach has always been the antithesis of the Herbst’s intentions. Arriving from Cape Town 15 years ago, they were delighted to find coastal land in New Zealand was largely undeveloped in comparison, giving them the chance to try something more low key. 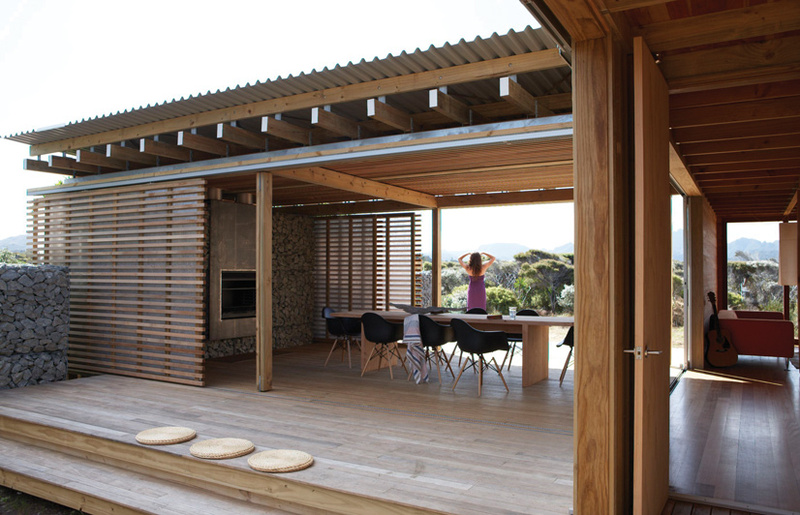 The couple had experienced similar ad hoc, cobbled together beach houses in South Africa. After the Great Barrier Island’s raffish charm won them over, they began to break down exactly what makes the bach so special in the nature-seeking psyche. So, the architects created a series of ‘semi-outside’ spaces. The deck is one example. 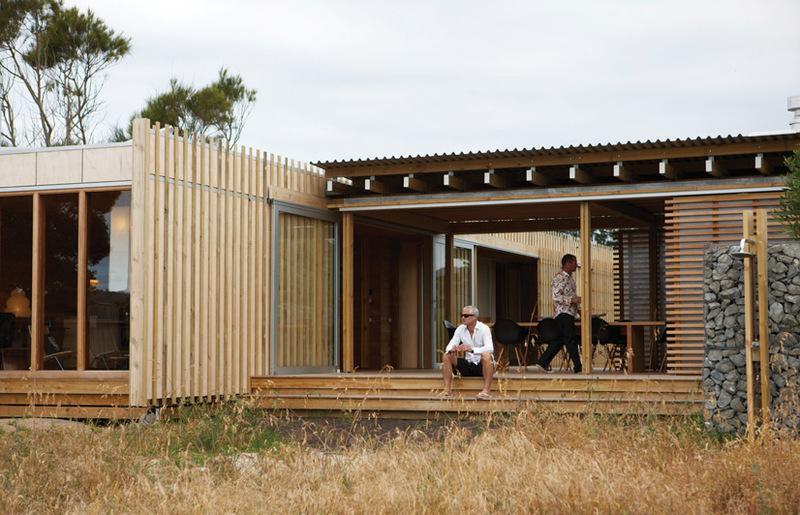 The walkway running the length of the container is another, and necessitates crossing the outdoor space to move between different areas of the house. Though mostly sheltered from the elements, the edges of the door panels are slightly inset, allowing air and light to penetrate and deliberately evoking a camp site metaphor. 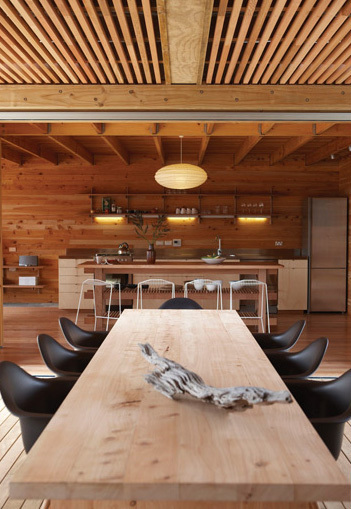 The structure of the house is legible in the interior design, with visible posts, rafters and beams that add interest and dynamism to the internal spaces. 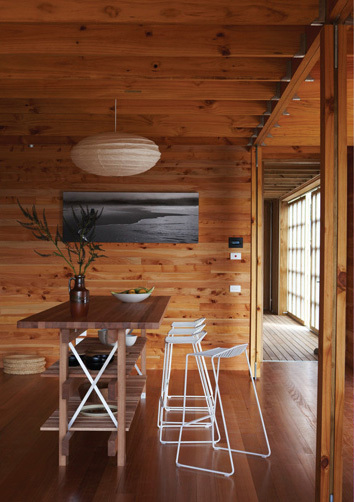 Sustainable woods were used throughout – radiata pine for the structural elements, cedar joinery, macrocarpa walls and Tasmanian oak floors. 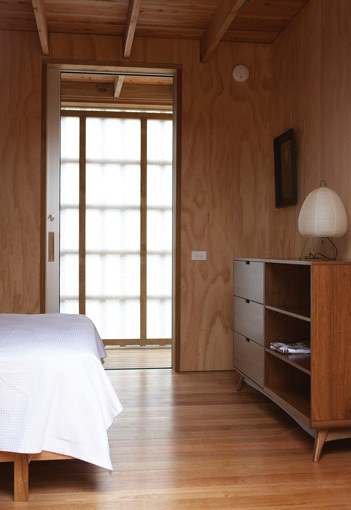 This gives the light a mellow quality, the exposed wood grain lending its own low-key detail. 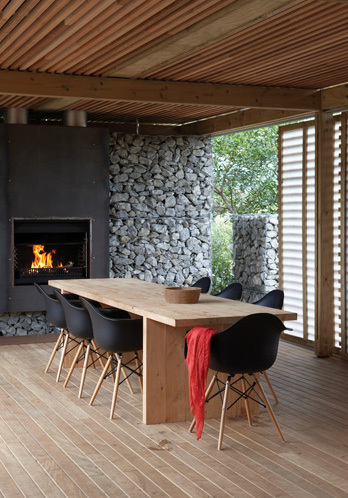 ‘We’re interested in the patina that develops through age with Corten steel or cedar that fades to driftwood-grey colours, and letting nature do its thing, instead of plasticising everything,’ says Nicola. The architects designed all of the built-in furniture and the large outdoor table, but were also commissioned by the owner to choose everything else, from the Noguchi light fittings and Candywhistle bar stools, down to the cutlery. The open shelving of the island bench adds an urban touch, and was designed to specifically resemble a piece of furniture, a kitchen table, rather than a solid ‘block’ to hide appliances. And that, of course, is the bach’s main point of difference – it has no extra appliances. ‘Some visitors arrive and they can’t believe they can’t just plug in a hairdryer,’ Lance laughs. The fridge, lights and stereo are powered by a photovoltaic system; there’s gas for heating water and cooking, if it isn’t done over the outdoor fire. The indoor brazier is an efficient space heater in winter. Rainwater is collected from the roof, filtered, used and then put through an on-site sewage treatment system. ‘The lovely thing about the Barrier is that it’s forced us to do very sustainable buildings, because you have to be self-sufficient,’ he says. Just one question. Can you stay here? Please send details if you can.